Simple and elegant, our Silver Paper Lanterns add a touch of class to your wedding, bridal shower, or party setting. Made of durable glossy paper stretched over sturdy wire frames, these hanging globe decorations can be used indoors or out and suspended from something as light as a tack. Silver Paper Lanterns arrive flat but quickly pop into shape, and can be collapsed for easy storage when the party's over. 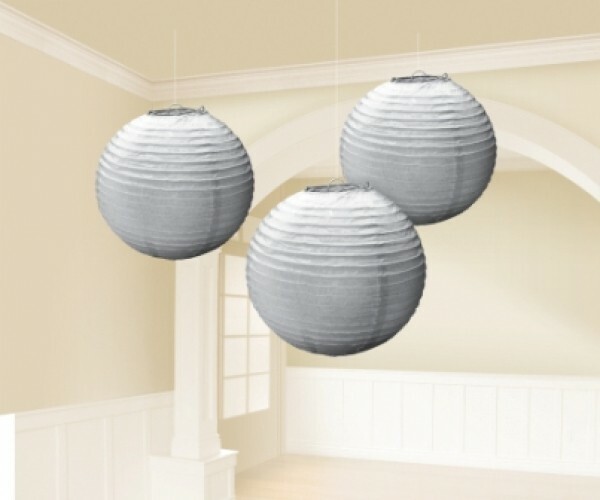 Package contains 3 Silver Paper Lanterns, each with a 24 cm diameter. Clear nylon string for hanging. NOTE: Lanterns are for decorative purposes only. Do not hang over light bulbs or near open flames. Simple and elegant, our Silver Paper Lanterns add a touch of class to your wedding, bridal shower, or party setting. Made of durable glossy paper stretched over sturdy wire frames, these hanging globe decorations can be used indoors or out and suspended from something as light as a tack. Silver Paper Lanterns arrive flat but quickly pop into shape, and can be collapsed for easy storage when the party's over. Package contains 3 Silver Paper Lanterns, each with a 24 cm diameter. Silver Paper Lanterns include: 3 paper lanterns, Clear nylon string for hanging. NOTE: Lanterns are for decorative purposes only. Do not hang over light bulbs or near open flames.